Contract rummy is a Rummy card game, based on gin rummy played by 3 to 8 players. It is also known as Combination rummy, Deuces Wild Rummy, and Joker rummy. Contract rummy is played with multiple decks of 54 standard playing cards, including the Jokers. Aces are high and low (above a King), and Jokers are wild cards. The number of decks varies from 2 to 4 and is based on the number of players (see chart). Each game is based on 7 rounds of hands, and the rules for each hand are unique. One person begins as dealer for the first hand, and then the person to the dealer's left becomes dealer for the next hand, and so on. Each player is dealt ten cards for the first four round and then 12 for the last three. The rest of the deck is then placed face down in the middle of the players; this is referred to as the stock. One card is taken from the top of the stock and placed face up next to it. This card is called the upcard and becomes the beginning of the discard pile, other wise known as "dead", or no longer in the game. The first player to play is the player to the dealer's left. Play always progresses in this clockwise direction. Each player has a choice at the beginning of their turn. They may either pick up one new card from the top of the stock or take the upcard. After the player draws his card, either from the stock or the upcard, he must then choose any card in his hand to discard, and he then places this card face up on the discard pile. That card then becomes the new upcard, which the next player in turn can take. The object of each hand is to come up with the correct combination of cards to be able to meld, or "lay out". The combination for each hand is different (see chart), and they become more difficult with each subsequent hand. The combinations for each hand are either sets or runs or a combination of both. A set is a combination of a specific number of cards of the same rank, and the suit is not important. A run is a combination of a specific number of cards of the same suit that have consecutive ranks. A player must have both a set of 3 cards and a run of 4 cards in his hand before he can meld in certain rounds. A player can meld only when it is his turn. As always, he must start his hand by drawing a card, then when he has the correct sequence of cards, he can meld or "go down." He does so by laying his meld cards face up on the table in their correct sequence. He can only lay out his meld cards and no additional cards. After melding, a player can then play on the melds of other players. When done, he must then discard. If the player has no more cards in his hand after discarding, he is declared the winner. The player must have a discard and may not discard a playable card. 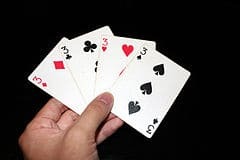 If the player does not have a discard he must take the top card from the discard pile and the top card from the stock, play any cards playable, and then discard. When a player is "down" (meaning he has already melded), he still takes his turn in turn with the other players, and he still must draw a card and discard. A player who is down can play his cards on the melds that have been completed either by himself or by other players. For example, if a player has laid down a set of 3 8's, and on a subsequent turn he then draws another 8, he can play this 8 on his set of 8's. He does this by placing the 8 with the set of 8's. If he has a card that he would like to play on a run, he must be sure to keep the order of the run. For example, if there is a run of 5 consisting of 4-5-6-7-8 of clubs, the player can play a 3 of clubs or a 9 of clubs. If a run has a wild card in it, the player can replace the wild card with the appropriate card (that player can then place the wild card on any melds). For example, if the run had 5-6-Joker-8-9 of clubs and he had a 7 of clubs, he could replace the Joker with the 7 of clubs. Unlike the limitation of the number of wild cards in the original meld, there is no limitation as to how many wild cards can be put into a hand that is already down. Play progresses until one of the players "goes out," meaning he is able to discard the last card in his hand. Although you may discard throughout the game, to win you must be able to play both cards - you cannot "get out" by discarding your last card in your hand, meaning you may not "get out" until you have two "playing" cards. Playing means that you can put those two cards down on top of the "playable" piles. If this may happen to you, you can discard one card only. But, you must win by playing both cards. So, if you have a player, hold onto it and keep drawing until you can then play both of your two cards. That player is then the winner of that hand, and the hand is then over. The winner for the hand gets zero points, and the other players count their cards to determine their score for the hand. After all seven hands are played, the winner is the player with the lowest score.